Showing? : This baby is beginning to make itself known to the world. Though I really just look fat. Weight Gain: 2 lbs as of this morning. Milestones: I'm in the second trimester! I really need to get Scott to start taking these pictures so they aren't always in a bathroom. Heeelllloooo, second trimester. So good to see you. I am very happy to bid good riddance to your evil sibling the first trimester. Now, let's just pause for a while. I would like to hang out here in the middle indefinitely. 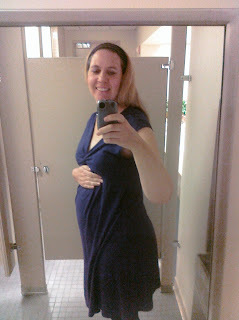 It's not that I don't want to meet this baby, but I am scared of the changes (excited and scared all at the same time). I'm scared of having less of me to give to Caroline. To Scott. To everything. I'm scared of the sleepless nights. I'm scared of the all consuming nature of newborns. But I am excited. What is sweeter than a newborn baby? Nothing. That's what. So 2T, let's hang out for a while. I'll enjoy this happy stage of pregnancy and get used to the idea of what's ahead. You just hang in there and keep the weight gain under control- your love of carbs and aversion to meat is going to be a problem.